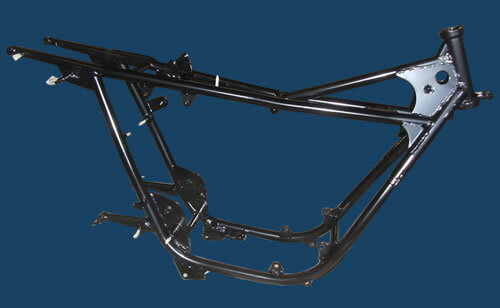 We are happy to clean and coat all types of motorbike components from bike frames, tanks and wheels through to individual components such as chain guards, panels and mud guards. Parts must be delivered ready for treatment, ie, removed from the bike with any threads or bearing surfaces masked. We are equipped for all types of paint removal and can offer powder coating or wet spray finishes on all items. Our service is aimed at bike owners that require a good clean standard finish, we do not do custom artwork. If you have a bike part that you want painted, please feel free to give us a call to find out what we can do for you. We also offer soda blasting which is ideal for motorbike engine and gearbox cleaning and other applications that require a sensitive treatment, read more on our Soda Blasting Services.